June 11, 2017 – National Corn on the Cob Day – Day 214 P.E (Post Election). Audacity of hope – Comey stated that Trump said, “I hope you can see your way clear to letting this go, to letting Flynn go. He is a good guy. I hope you can let this go.” Comey said he took that as a direction from the President to let Flynn go. Comey said he ignored that message. There are actually really smart people involved in our government (and I’m not very well read) – Comey and Senator Angus King (I-ME) nearly had a “jinx buy me a Coke” moment when they both thought at the same time that a quote from Henry II, “Will no one rid me of this meddlesome priest?”, was apropos to describe Trump hoping Comey would help him. Trump doesn’t care that Russia interfered – According to Comey, Trump continued to ask about the investigations into Trump and his team, going so far as to tell Comey that he hadn’t been involved with “hookers” in Russia. Tellingly, Trump never asked Comey about the fundamental issue of Russian interference in the election. Senator John McCain (R-AZ) may not be okay – The Senator’s comments and questions during the hearing gave the impression he did not really understand what was happening. He later blamed his incoherence on staying up late to watch an Arizona Diamondbacks game, which is another sign he may not be okay. Comey is a leaker of classified information! – Republicans like Senator John Cornyn (R-TX) tried to tarnish Comey with being a “leaker”. There are two problems with that argument, however. First, Comey shared his personal memos, which contain information that was not classified. Conversations with the President are not automatically top secret. Second, Trump himself put the content of the memos at issue, likely waiving any claim that the memos were subject to any Executive Privilege. It has been interesting to see the party of law enforcement smear the former head of the FBI. Trump was vindicated! – In his formal written statement (in which he mistakenly spelled president, “predisent”), Trump’s personal attorney Marc Kasowitz said Trump felt “completely vindicated” since Comey said Trump, at the time, wasn’t under FBI investigation. This ignores the whole “firing Comey because he would not play ball on Russia” thing. Also, note that in his testimony Comey didn’t say whether Trump was now under investigation. Trump’s an inexperienced idiot! – As Dr. Simon Finch-Royce once said to Diane Chambers, “Ah, the song of the TRULY desperate.” Speaker of the House Paul Ryan (R-WI), who will say anything to cut taxes for millionaires, defended Trump by saying, “He’s new at this.” New at what? Not being able to threaten people successfully and shake them down? Ryan one-upped the ridiculousness of that statement by saying that Republicans would not be suggesting impeachment if a Democrat had done what Trump has done. If this had been Hillary, Paul Ryan would be president already, having impeached both Hillary and Tim Kaine. As for Trump, his staff had national security adviser H.R. McMaster, Secretary of State Rex Tillerson, and Defense Secretary James Mattis babysit him during the hearing to make sure he didn’t tweet. Seriously. 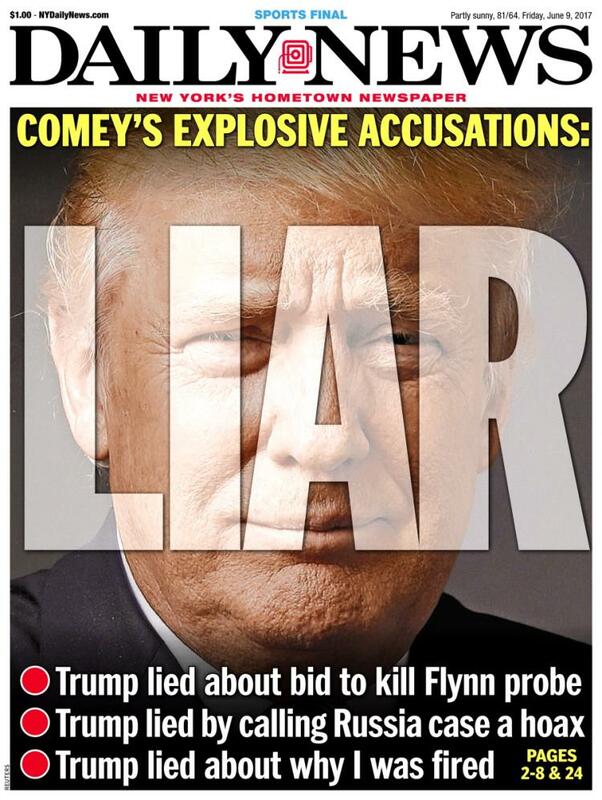 Once his sitters left, Trump accused Comey of lying, i.e., he said the former FBI Director committed perjury in front of the Senate. He also called Comey a leaker. How someone could be a leaker of lies is not clear to me. Trump said, he’s “100%” willing to testify under oath. I would say, “I’ll believe it when I see it,” except even if Trump does testify under oath, I won’t believe him. Meanwhile, Americans were being told to believe different things about the testimony depending on the outlet. 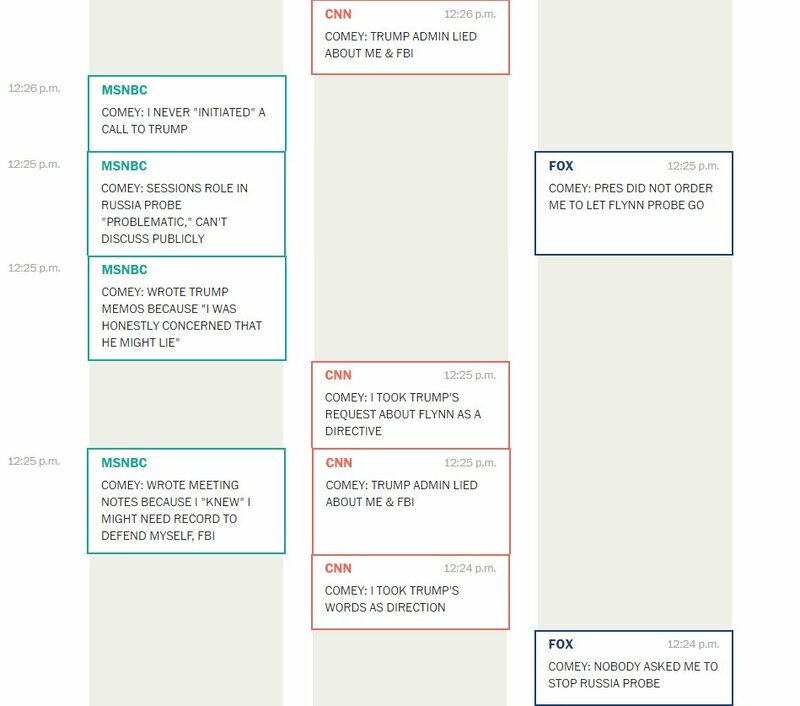 The Washington Post tracked the chyrons on MSNBC, CNN, and Fox News during the hearing. This week, Saudi Arabia, UAE, and Bahrain broke off diplomatic relations with Qatar and closed all land bordersto the small kingdom because of Qatar’s alleged support for terrorists. The UAE has even made it illegal to express sympathy for Qatar. The countries acted after a story was published by the Qatar News Agency that Qatari emir Sheikh Tamim bin Hamad al Thani expressed support for Iran and Israel, and criticized Trump. I wish I could say that Trump handling a global conflict with 140 characters was the worst of it, but my wishes have not been granted much since November 2016. First, like everything else in Trump’s orbit, this situation has a Russian conspiracy angle. The FBI is investigating that the Qatar News Agency report that triggered the action was the result of Russian hackers planting the story. It’s fake news designed to launch a war. Yep, basically Trump, i.e. the United States, may have fallen for the plot of the James Bond film Tomorrow Never Dies. Second, it turns out that Qatar is a pretty big ally of ours. We have 10,000 troops based in Qatar, from which we launch offensives against ISIS. Our President should probably take their safety and our foreign policy objectives into consideration before he throws the covfefe at Qatar. Speaking of our foreign policy objectives, the nadir of this situation (so far) occurred on Friday afternoon. Within minutes of Secretary of State Tillerson issuing a statement aimed at deescalating tension and asking all parties to come closer together, Trump smacked down Qatar only again. There is no consistent message from the United States. If Health Care is Cut and No One Hears It, Did It Happen? The Senate GOP is continuing to draft its revised tax cut health care bill in secret. After publicly saying it was doubtful that they could pass something, Senate Majority Leader Mitch McConnell (R-KY) has now put the as yet unseen bill on a fast track to passage. Rumors are that Republicans are at or close to 50 votes, with Pence being the tiebreaker. The bill allegedly is the same as the terrible House bill, but adds several spoonfuls to make taking away medicine from millions go down easier. We likely have just two weeks to stop this. The suspected plan is that during the week of June 26, the Congressional Budget Office will release the score on the bill. Then the bill will be made public and likely within 24 hours, before there can be any analysis or debate, the Republicans will pass it. They must do it then as it’s unlikely they’ll have the guts to do so after hearing from constituents during the July 4 recess. There will be no hearings. There will be consultation with experts. There will be no amendments. There will be no testimony from those affected. There will be no consultation with the Democrats. This is simply a disgusting and cynical approach to public policy. Follow this link to hear Senator Claire McCaskill’s (D-MO) disgust, anger, and sadness at the Republicans approach as well as Senator Orrin Hatch’s (R-UT) inability to defend it. Keep Calm and Ignore Trump – Last weekend, terrorism hit London again when a van ran over pedestrians on London Bridge, followed by terrorists leaping out of the van and stabbing dozens; seven were killed. There were many heroes that day from the baker who fought off the terrorists with a crate to the man who fled a bar andreturned later to settle his bill (we can’t all be Harrison Ford in Patriot Games . . . but we can at least make the world better by being a good person). In the midst of this terrible event, one person stood out as a coward and a bad person, Donald Trump. Trump determined that the best reaction to a terrorist attack in the largest city of our closest ally was to attack the mayor on Twitter. “Pathetic excuse by London Mayor Sadiq Khan who had to think fast on his ‘no reason to be alarmed’ statement. MSM [Main Stream Media] is working hard to sell it!” Trump was reacting to Mayor Khan informing his citizens that there would be an increased police presence over the coming days and that the people should remain calm. Apparently, Trump has a visceral relationship to brave leadership . . . or maybe it’s just people named “Khan”. Last summer, he went after Gold Star parents, Khizr and Ghazala Khan. Genghis, Wrath of, and the tiger in the Jungle Book, you’re all on notice. Building Burning Bridges – This week was officially “Infrastructure Week” at Trump’s White House. I’m not sure exactly what that means; it sounds kind of a like one of those special weeks when Pat and Vanna would take Wheel of Fortune to Omaha or somewhere. Anyways, you may recall, that in the halcyon days when many were trying to convince themselves Trump wasn’t actually an orange Baby Huey with ADD, people pointed to infrastructure investment as something positive that could come out of a Trump presidency. What would Trump’s big “Infrastructure Week” idea be? Rebuild our failing bridges? High speed rail? A 200-mile water slide from Trump Tower to the White House? Nope, he wants to privatize Air Traffic Control. Trump’s big public infrastructure move is to sell off public infrastructure. I have to turn to the Wheel for how best to describe that idea . . . bankrupt. Like Stealing Money from Kids with Cancer – Before he had the power to take health care away from millions to give himself a tax break, Trump made ends meet by taking funds raised to help child cancer patients. Eric Trump’s foundation runs a golf tournament to benefit St. Jude’s. A big selling point has been that almost 100% of the donations go to help the kids, since the foundation could use the course at Trump National Westchester for free. That was initially the case. However, Ebenezer Trump saw an opportunity to take Tiny Tim’s crutches and just couldn’t help himself. According to Ian Gillule, former membership and marking director at Trump National Westchester, “Mr. Trump had a cow. He flipped. He was like, ‘We’re donating all of this stuff, and there’s no paper trail? No credit?’ And he went nuts. He said, ‘I don’t care if it’s my son or not-everybody gets billed.’” Tournament costs billed by Trump’s golf course to Eric Trump’s foundation suddenly jumped up to $142,000 in 2011, and increasing to $322,000 in 2015. As The Tяump Turns – Outside of the small issues raised by James Comey, there were some b and c plots on this week’s episode of As The Tяump Turns. First, Deutsche Bank, which has been fined recently for its role in laundering $10 billion in Russian oligarch money ignored requests from the House of Representatives regarding Trump’s financial ties to Russia. Second, the FBI arrested 25 year-old government contractor, Reality Winner (seriously, that’s her name. We are so far through the looking glass, I can’t believe her name isn’t “Jabberwocky”), for sending a highly classified National Security Agency document to The Intercept. Much discussion has been about her arrest and The Intercept’s failure to protect its source. There has been less focus on what the document says – namely that Russian military intelligence executed a cyberattack on a U.S. voting software supplier and sent fishing emails to over 100 local election officials. This is your periodic reminder that one of the first things the Republicans did this legislative session was vote to shutter the sole agency responsible for safeguarding against voting machine hacking, the Election Assistance Commission. What’s the Worst That Can Happen? – While the nation was transfixed on the former FBI Director calling the President a liar, the GOP thought the best thing to do to help get our country back on track would be to repeal Dodd-Frank. Dodd-Frank is the set of regulations put into place to attempt to regulate big banks and provide consumers with protection after unbridled Wall Street nearly destroyed the entire world economy. The repeal vote breakdown was 233 in favor – 1 against for Republicans and 0 – 185 for Democrats. Tell me again how there’s no difference between the parties. Democrats will likely filibuster this bill in the Senate, killing it for now. And Then They Came for Us Weekly – Trump’s tiny fingers have worked their way into every nook and cranny of our lives. However, there was still one place I could go to get away from it all, a place where I knew everybody’s name and they were just like me, the pages of Us Weekly. Well, this week, that sanctuary of celebrity news was violated. On the cover was a puff piece on Ivanka, declaring, “Why I Disagree with My Dad.” In March, the media conglomerate that owns The National Enquirer purchased Us Weekly. That conglomerate is owned by a huge Trump supporter. Expect to see in coming issues about how White House staff are just like us! They hide in bushes, they pocket tweet, and they don’t work on weekends! The Badger (the Poor) State – Wisconsin continues to do all it can to distance itself from its progressive past. On Wednesday, it became the first state to submit a request to drug test its applicants for Medicaid. I mean everyone knows that the best and least cost-effective way to treat people with drug addiction is to cut them off from all public services. A Slick Attorney – Trump nominated Jeffrey Bossert Clark for the top environmental lawyer for the Department of Justice. What’s Clark’s relevant experience? I’m sad you asked. Clark represented BP in lawsuits from the 2010 Deepwater Horizon disaster, the worst oil spill in U.S. history. When not keeping money away from oil covered seabirds, Clark challenged U.S. climate policy on behalf of the Chamber of Commerce. Kansas Finally Has a Brain – Under the leadership of Governor Sam Brownback (R) and with the support of the Koch brothers, Kansas became the laboratory for the “tax cuts + government spending cuts = a private jet in every garage” economic theory. This may sound familiar to you as Brownback’s former congressional staffer, Paul Ryan, is working with Trump to take this plan national. Well, it’s been such a failure that the KansasRepublican-controlled legislature overrode Brownback’s veto this week, undoing the tax cuts and increasing revenue by $1.2 billion over the next two years. It’s a triple shot weekend here at The TrumpShaker. I’ve got three articles pleading with Trump to step down and for the Republicans to finally take responsibility for the danger they’ve put the world in by allowing a nuclear-armed toddler to run the country. It’s go time to fight AHCA/TrumpCare/WealthCare/RepubliCare/Don’tCare/the premature death of millions. If you live in or have friends or family in Alaska, Arizona, Arkansas, Colorado, Louisiana, Maine, Nevada, Ohio, South Carolina, Tennessee, or West Virginia, then you need to be calling your Republican senator as often as you can over the next two weeks. Ask for the staffer in charge of health care. 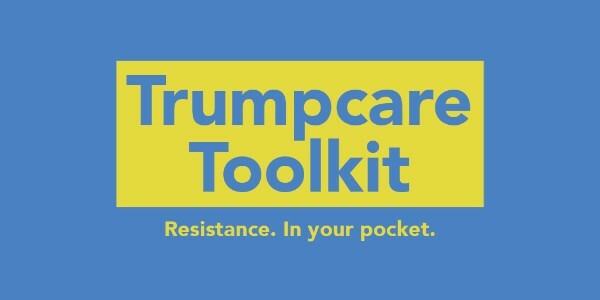 This TrumpCare Toolkit provides you with the numbers and talking points you need to make a difference in the lives of millions.